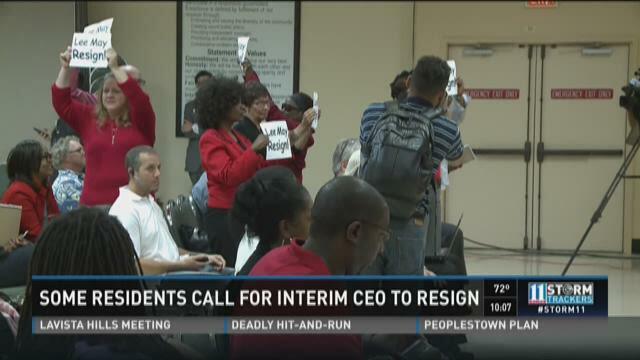 DECATUR, Ga -- A fiery meeting in DeKalb County included calls for the Interim CEO to resign. It was a meeting originally scheduled by Interim CEO Lee May, but he wasn't there. "People were planning to come here, people made child care arrangements, people changed their schedules to be here, so again I want to be respectful of their time," Jester said. About 70 people showed up, some of them holding signs that read "Lee May Resign." "We need a lot of things besides these elected officials spending their whole day trying to figure out what they're going to have for lunch," Jerry Jackson, Jr. told the crowd. Each speaker had a different agenda ranging from fixing Watershed Management and Animal Services to condemning a proposed soccer complex. "They're talking about this soccer field, going to spend about $17-million to $30-million dollars on a soccer field," said Joe Edwards. "Hell, my street needs to be resurfaced." Viola Davis said DeKalb residents need to demand two things after an independent investigation found appalling corruption caused by a complete absence of leadership. "Don't you run another audit unless you are looking for criminal activity," she said. "Second, we want a RICO (racketeering) investigation." A spokesperson for the county said Lee May rescheduled Thursday night's meeting, and will hold a series of community meetings in the next few weeks. Five are scheduled and three more will be announced, Burke Brennan said in a press release.